Before going to the Aksuu lodge please contact us by phone or email to confirm the date and meeting time. Aksuu yurt lodge located at the Almaluu gorge which starts at Teploklyuchenka (also known as Ak Suu) village. You can hire a taxi or van at Karakol and easily drive to our village. It is just 8km from Karakol city. Check the google maps to understand where the Aksuu Lodge is. All you need is to get to the pickup point where we will meet you and transfer with snowmobiles. If you wish to skitour/walk to the lodge site then you should start at the pickup point anyway and follow into the gorge. 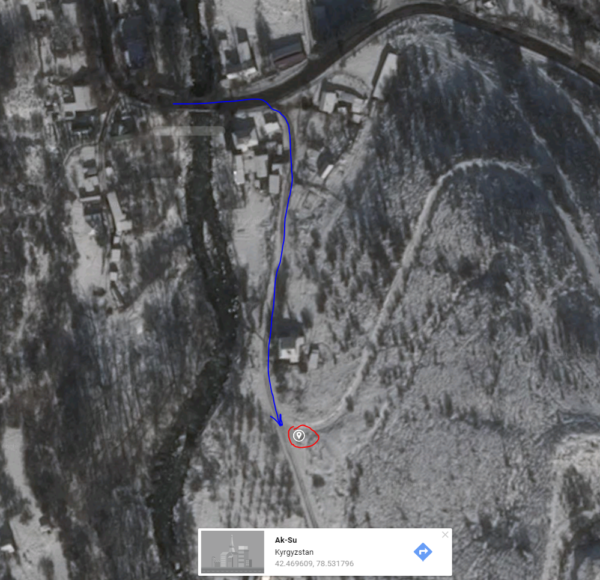 Here is the route from Karakol Coffee in Karakol city to the pickup point at Teploklyuchenka.